Up to 35hrs.Assam & White Cedar An enlivening blend with top notes of grapefruit and green violet, layered with rich notes of golden assam and delicate lily, resting on base of white cedarwood. Each fragranced in the Fired Earth collection contains an exquisite blend essential oils. 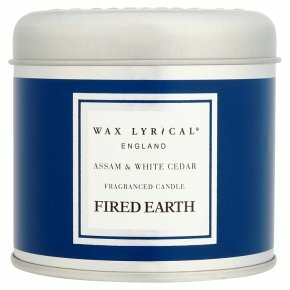 Assam & White Cedar Fragrance and colour have both been inspired by 'Woad Blue' from the Fired Earth paint collection. Please retain packaging for future reference. Never leave a candle burning unattended. Leave at least 10 cm between candles. Donot burn candles on or near anything that can catch fire. To prevent a dangerous flame, keep the wax pool clear of debris. Use on a level, heat resistant surface. Discard candle when 55 mm of wax remains. Snuff out flame, do not blow it out. Never move a burning candle. Keep out of reach of children. Read label before use. If medical advice is needed, have product container or label at hand. Do not use lid as a coaster.